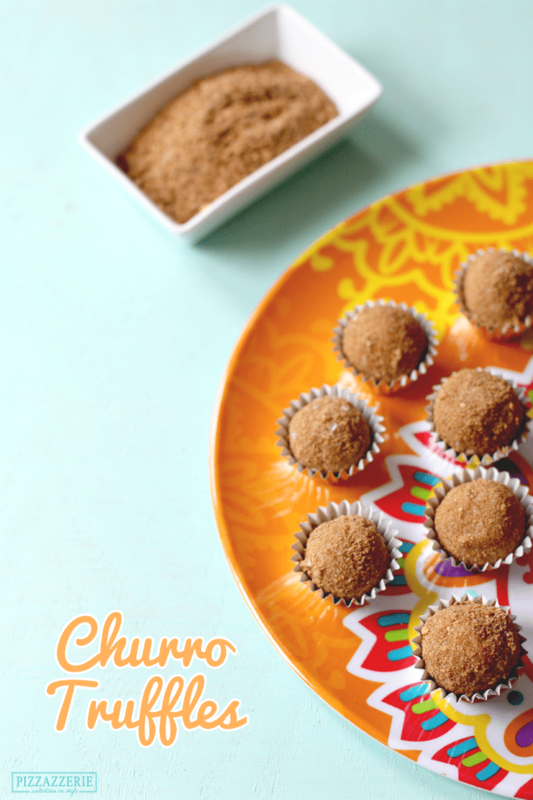 Cinco de Mayo Recipe: Churro Truffles! I love Cinco de Mayo. Seriously love. Mexican food is my all-time fave and the bright colors, parties, and margaritas? Hello. It doesn’t get much better than that! Well, except for churro truffles! Churros are fried-dough pastries rolled in cinnamon sugar and often conducive to Cinco de Mayo. I happen to love making mini versions of things and though I could have come up with a baked churro you could make at home, the always fab Sprinkle Bakes has done it so beautifully right here. (If you don’t have her book, by the way, get it!). So I decided to come up with a churro-flavored truffled. They taste JUST like little churro bites! Bite size means you can eat 239843, just FYI. Here’s a little close-up for you! Now, on to making these bad boys. It’s easy. Don’t you worry! It just involves making the main truffle, chilling it, rolling it into balls, rolling the balls into the cinnamon-sugar crunch coating. It tastes just like a churro. Keep them refrigerated until ready to serve (pull them out about 15 minutes before serving). Here’s the recipe! Enjoy + share if you love it! Use a double broiler to melt together white chocolate chips, cream cheese, and heavy cream. You could also use a microwave-safe bowl at 30-second intervals but be careful as white chocolate can burn easily. Once smooth, add in vanilla extract, 1 tablespoon cinnamon, and brown sugar. Stir well and remove from heat. Chill for 3 hours or until firm enough to roll into a ball. Use a food processor (or put in plastic bag and crush) to pulse together graham cracker cookies, 2 tablespoons cinnamon and granulated white sugar. 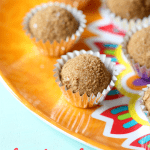 Remove truffle filling from refrigerator and roll into balls. Use a melon ball scoop to help with sizing. 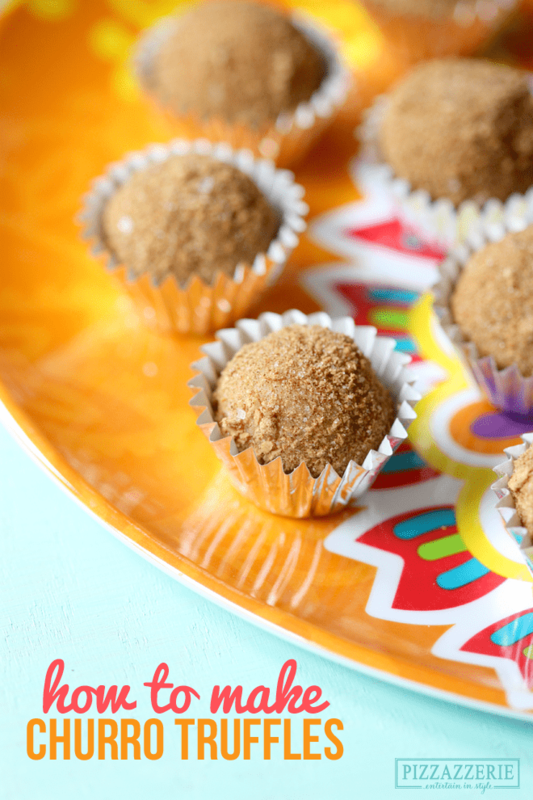 Roll balls into crunchy cinnamon sugar coating. Place in truffle cups (optional) and enjoy! Children’s Book Themed Baby Boy Shower! Frostings Cookbook on Pre-Order + Free Calendar! They look yummy,I can’t wait to try them this weekend! Where did you find that cute platter? What type of graham cracker cookies did you use? I just used regular graham crackers (not honey or cinnamon sugar – though you could) from Kroger. Thanks so much! I will trying these this weekend! Courtney, not only do these sound delicious, but they look so darling! Bookmarking this recipe! I’m fairly certain cinnamon and sugar are my favorite things ever. And I’m also fairly certain I will be making these churros tonight. I’m definitely going to try these…they seem easy and look great! These sound yummy, great fun idea. I could see these being served at a child’s birthday party! not a big fan of churros, but these do look appetizing! Look and sound wonderful. I love Mexican, too. We often go out for it but you are too stuffed after the meal for dessert. Great way to have a Mexican dessert at home. I have never seen these before, but they look really good. These sound amazing. I would love to try them. This sounds so good it’s wrong! I love churros, and it’s hard finding good ones. We have taco shops on every corner where I live and they all sell them, but they’re not great :( I’ll have to give these a try! These look awesome and unique! Will be giving these a try. i loveeee churros and those truffles sounds awesome!!! definitely Im going to try them!!! I am a baker and I am always looking for new things to try out. This recipe sounds awesome and yummy. I like to look for recipes that I tend to have the ingredients around the house already. Most of these I usually have so I could throw this together easily. Thanks again!! These look delicious! I used to love to go to Price Club (now Costco) as a kid and get one of their hot churros. I can’t wait to try these truffles out! Thanks for the recipe! These sound wonderful and truly like something I have never had before. Though you have to drag out the double boiler and give them time to cool the recipe still seems pretty easy all in all. I tried this recipe exactly as written and ended up with a gooey product that refused to stay in a ball shape even after the filling was frozen over night. Any suggestions? They tasted fabulous, but looked quite ugly. oh my goodness. I will have to make these for an upcoming baby shower! Look delicious!!! These sound so yummy. I am only able to get churros when the fair is in town. Now I can make the next best thing. Thank you so much for sharing. These look and sound amazing… I pinned it so I could check this out this weekend!!! 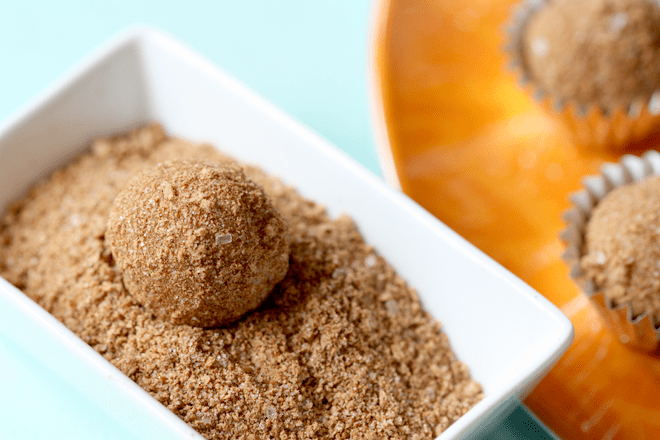 Thanks so much for sharing a truffle that isn’t all chocolate… I LOVE cinnamon! Churros are my favorite treat! What an awesome recipe! Sounds interesting. Something I haven’t heard of or thought of. I like Churros and I like truffles so why not? Good idea- I’ll have to try these! These look so easy to make but look oh so good. I have never heard of these before. They sound beyond amazing! I am definitely going to make! i love churros,i’m going to make these…thank you for sharing. Oh man – I love churros! Every time I drive by a Food City I secretly pray that there’s a churro stand out front. Can’t wait to try this recipe! Those sound so good. I don’t know what a churro is though.I’m going to try. Thanks. This sounds like a delicious recipe. Any recipe that uses cream cheese and any type of chocolate will be something I love to eat. It also does not seem hard to make. Thanks for this recipe. These sound amazing! They remind me of doughnut holes from DD. I made these for my coworker buddies for Cinco de Mayo. They were a hit! Absolutely delicious! Thank you for sharing! Thanks Milli!! So glad you and your coworkers loved them! Just came across this recipe and it looks great! Can these be made ahead of time and stored in the freezer? Hi Sara! Thanks! While I have not put them in the freezer myself, so I can’t say for certainty but I don’t see why not! Thanks for the yummy recipe! Sharing it on my blog today!